[Mobile Edition only] Added a callback function for initLicenseFromServer so that developers can check if the license is active and valid. [Android SDK only] Added a new method getVersion to return the version number of the Android SDK. Improved deblur algorithm for OneD, enhancing the recognition rate for blurry/out-of-focus barcodes. Improved the accuracy of border location and symbol segmentation for AZTEC. Optimized line scanning algorithm for OneD, decreasing the computation load for character recognition. DecodeBuffer now supports 48-bit and 64-bit image data. Reduced the library file (.WASM) size to around 2MB. Reduced build time by 106% and Improved decoding time by 98%. Improved the recognition rate of 1D codes with a new verification algorithm. Greatly improved the image-processing performance for blurry PDF 417 codes and decoding performance for blurry 1D, QR, and Data Matrix codes. Decreased error recognition rate for Aztec Codes. Improved average reading speed by 5-10%. Greatly improved the image-processing performance for blurry PDF417 codes. Improved decoding performance for blurry 1D, QRCode and DataMatrix codes. Fast loading and initialization and support of Web Worker to ensure seamless and smooth barcode scanning instantly. Improved the decoding performance for Aztec, increasing the recognition rate. Improved the decoding performance for OneD, decreasing the error recognition rate. [iOS Edition] Added support for Bitcode. Improved the decoding performance for 1D barcodes, decreasing the error recognition rate. [Linux Edition only] The .so file no longer depends on the libgcc and libstdc++. Added a BatchDecode tool which helps developers evaluate the recognition performance and speed of the Dynamsoft Barcode Reader SDK. Added a new sample demonstrates how to use Dynamsoft Barcode Reader in multiple threads. [Mobile Edition only] Added the runtime licensing mode. Please refer to this article. Improved barcode reading speed by 10%, especially for small-sized images. Reorganized API documentation to help you find content more easily. Simplified Developer’s Guide to guide you through creating a HelloWorld project more quickly. Decreased misreading rate for 1D barcodes. Enhanced performance for reading multiple barcodes from an image. Greatly improved recognition rate for QR Code and DataMatrix on complicated backgrounds. Greatly improved recognition rate for barcodes on grid background. Optimized localization for PDF417 without enough quiet zone. New console samples – Decode Single Barcode, Decode Multi-Barcodes, Read Barcode from Region, Trigger Event after Decoding - are now available in the installer. Easy and flexible to create a custom barcode reading template for your specific use case. Greatly improved barcode reading speed. Optimized reading accuracy and speed for blurred QRCode and DataMatrix. Improved the speed for reading barcodes directly from a computer/phone screen. The new product updates and improvements are for Windows Edition only. Added GetTemplateSettings and SetTemplateSettings methods which allow you to review and adjust barcode reading settings at runtime. Improved localization algorithm for barcodes rotated in a degree or with poor perspective. Faster read speed for QR, Data Matrix and PDF417 barcodes. Improved average reading speed by 50% in a four-core CPU environment. Improved the reading accuracy and speed for blurred QRCode and DataMatrix. Improved reading speed for small barcodes in high-resolution images. New de-blur algorithm for 1D barcodes to improve the accuracy when scanning linear barcodes from out-of-focus, blurred images. New multi-thread processing to improve the scanning accuracy and speed of 1D and PDF417 barcodes. Added new APIs that enable you to specify page numbers, barcode regions, barcode width, barcode height, barcode module size and barcode angles for barcode detection. These greatly improve the decoding workflow and barcode reading efficiency. Added ImageCaptureDevice API to set the capture device (scanner, camera or fax) being used to scan barcode images. When set, it will use more appropriate image processing techniques on the images captured from that device. Added TimeoutPerPage API to set the maximum amount of time for reading barcodes on one page. Added BarcodeColorMode API to set the ink color for barcodes searching. Added BarcodeTextEncoding API to set barcode text encoding mode so that you can display special characters properly. Added ReturnUnrecognizedBarcode API to set whether to return unrecognized barcodes. Added LoadSetting API so that you can now load the settings to be used in recognizing barcodes from a JSON string. Added Angle API to set the angle ranges of barcodes for scanning. Added Angle property to return the rotation angle of a detected barcode. Improved the localization and recognition algorithms for PDF417 barcodes. Increased QR Code and DataMatrix barcode recognition speed for B&W images. Optimized the de-blur algorithm for 1D barcodes to improve the recognition accuracy. Optimized the timeout support. Now it is possible to stop barcode recognition by timeout. [Windows Edition] Fixed a bug that caused incorrect result points if de-blur algorithm is used when reading 1D barcodes. New multi-thread processing to improve the scanning accuracy of 1D barcodes. Added ImageCaptureDevice API to set the capture device (scanner, camera or fax) being used to scan barcode images. When set, it will use a better and more appropriate image processing technique to the images captured from that device. Combined C and C++ header files into one to simplify the reference of the header file. Fixed an issue where the DLL crashes when reading DataMatrix in multiple threads. New localization algorithm was implemented for 1D barcode scanning to improve barcode reading speed. New multi-thread processing was implemented for 2D barcode reading to improve decoding accuracy. Improved recognition for perspective QR Codes. Optimized decoding performance for large size, special angle and multiple 1D barcodes. Improved sample applications to support Visual Studio 2015. RESTful Web Service - implements server-side RESTful web service in C# for barcode reading. [Java] Read barcode from mobile webcam - reads barcodes from photos captured from mobile webcam in Java on the mobile phones or tablets. 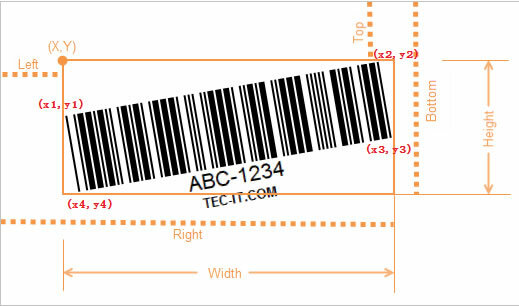 Supports reading a single barcode from Bitmap, images (PNG, JPEG and GIF) and mobile cameras (NV21). Both synchronous and asynchronous barcode decoding methods are provided. 1D Barcode – Code39, Code93, Code128, Codabar, ITF, EAN13, EAN8, UPCA, UPCE and INDUSTRIAL 2 OF 5. 2D Barcode – QR Code, PDF 417, Aztec and DataMatrix. Supports Android 4.1 and later. Supports reading a single barcode from images (UIImage) and mobile cameras (NV21). Both synchronous and asynchronous barcode decoding methods are provided. Supports iOS 7- 9; iPhone 4s and higher. [Linux Edition] Added PHP 64-bit support on Linux 64-bit. You can now use the barcode reader SDK to embed barcode recognition in a 64-bit PHP application for deployment on a 64-bit Linux server with Debian, Ubuntu or CentOS. Changed 1D barcode decoding module to improve recognition accuracy. Improved ResultPoints Property to adjust the sequence of barcode corner points. Now the top-left corner of the barcode is the starting point (x1, y1). The results are returned in the clockwise direction. [Windows Edition] Added support for PHP. Added new APIs DecodeStream, DecodeStreamRect, DecodeBase64String and DecodeBase64StringRect for C, C++ DLL. [Windows Edition] Added new APIs DecodeStream, DecodeStreamRect, DecodeBase64String and DecodeBase64StringRect for ActiveX/COM, .Net DLL. [Windows Edition] Added a new C# sample to demonstrate barcode reading from scanned document, captured photos and imported local image file. Added Error Code -10022: “PDF Rasterizer DLL Miss”. Improved positioning algorithm to better identify and localize DataMatrix barcodes. Added support for reading PDF417 and DataMatrix. [Windows Edition] Added reading barcode from all types of PDF file. [Windows Edition] A user-friendly demo guide program – "Dynamsoft Barcode Reader SDK" - is now available. You can run it from the shortcut icon on the desktop and have an overall view of all demos & sample code. [Windows Edition] An out-of-box application - "Process documents with barcode" - is now available. It can rename, split or classify documents via barcodes on images and we provide overall view of all demos & sample code. [Windows Edition] Improved the .NET DLL to support AnyCPU for enhanced platform integration. Added new APIs DecodeBuffer and DecodeBufferRect for the Windows Edition's ActiveX DLL. Added new APIs DBR_GetVersion and DBR_GetErrorString for the Windows Edition's C/C++ DLL. Improved 1D Barcode Reader to support reading Industrial 2 of 5. Reading image format of GIF is supported. Dynamsoft Barcode Reader is now made available as a standalone product, in addition to working as an add-on for Dynamic Web TWAIN and Dynamic .NET TWAIN SDKs. Various code samples (in C/C++/C#/Java/VB/VB.NET) available. See the Sample Gallery. Dynamsoft’s barcode recognition engine has been in existence since April, 2012. It works as an add-on to our Dynamic Web TWAIN and Dynamic .NET TWAIN SDKs. In this new release, we are changing the product name to Dynamic Barcode Reader and the version to 1.0. Updates in this version include 1D barcode improvements in accuracy and performance for Code 39 and Code128 recognition. Also image preprocessing is improved. For Code 128, the recognition ratio and speed have jumped up by as much as 30 percent.